Grassroots solutions to fight climate change and achieve food sovereignty and system change. The wellbeing of our communities, our natural world and our ability to feed ourselves in a just and sustainable way has been ravaged in just a few decades by corporate control of farming and forest systems. The numbers increase annually for both malnutrition and deforestation. The way we produce food and manage our forests are closely connected. Industrial agriculture is the leading cause of deforestation, while thousands of communities are evicted from the lands where they live and produce food in the name of forest protection. Politicians often resort to concerned ignorance on the question of how to protect forests while feeding nine billion people. Friends of the Earth International, along with our allies in peasants, indigenous peoples, small scale fishers and forest peoples’ communities know that solutions exist in these communities, and have been there for years. Forests and food production can and should be managed by communities themselves for collective improvement to conserve nature, feed people and to strengthen the community rights of thousands of people globally. Community forest management protects forests better than conservation approaches. Agroecology for food sovereignty is raising incomes, improving nutrition, increasing resilience to climate change and protecting biodiversity. This report shows that both agroecology and community forest management are political proposals, not just technical initiatives. 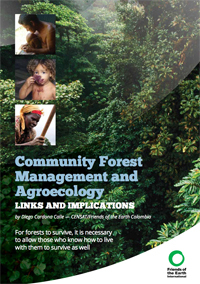 Agroecology and community forest management are intimately connected. Both strengthen community control of the territory, promote the Rights of people over profits for market economies, recognize the role and autonomy of women, promote social and solidarity economies and local markets, defend and manage traditional knowledge, community heritage and common goods and promote and strengthen a vision that is not centered solely on humans use of nature but also on the value of nature itself. Both agroecology and community forest management are under threat from the green economy, the financialization of nature, agribusiness and technical visions of forest management and agriculture that cause food shortages, deforestation and forest degradation. Our challenge is to put in place the institutional and societal mechanisms that can enable these solutions to flourish.